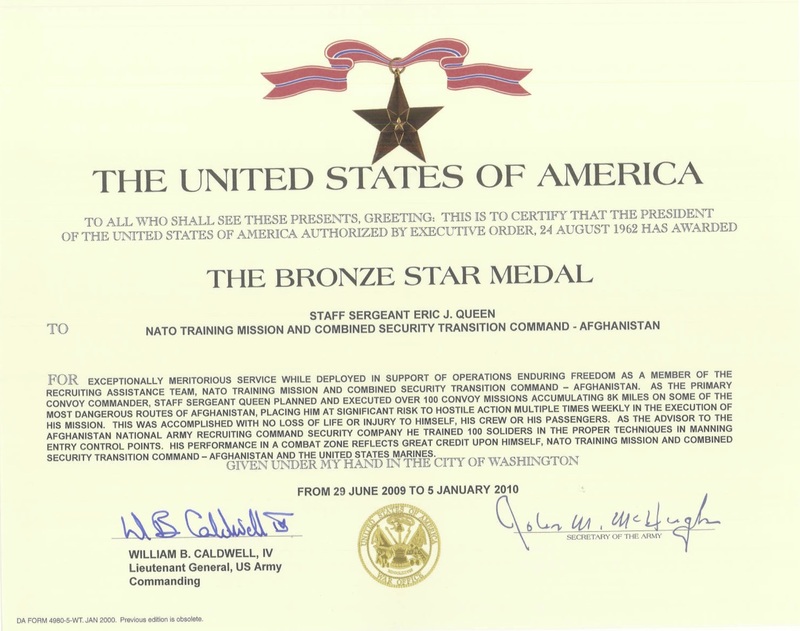 Eric Queen, a retired Marine seeking to unseat N.C. House District 3 Rep. Mike Speciale, is a Bronze Star recipient. I asked Queen for details. For exceptionally meritorious service while deployed in support of Operations Enduring Freedom as a member of the Recruiting Assistance Team, NATO Training Mission and Combined Security Transition Command – Afghanistan. As the primary convoy commander, Staff Sergeant Queen planned and executed over 100 convoy missions accumulating 8,000 miles on some of the most dangerous routes of Afghanistan, placing him at significant risk to hostile action multiple times weekly in the execution of his mission. This was accomplished with no loss of life or injury to himself, his crew or his passengers. As the advisor of the Afghanistan National Army Recruiting Command Security Company he trained 100 soldiers in the proper techniques in manning entry control points. His performance in a combat zone reflects great credit upon himself, NATO Training Mission and Combined Security Transition Command – Afghanistan and the United States Marines. From 29 June 2009 to 5 January 2010. Speciale was also a career Marine, serving from 1973 to 1995.